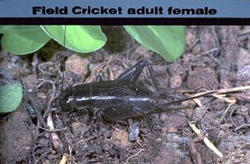 Diet: Field Crickets eat plant material including seeds and small fruits. They also eat both living and dead insects. If they become very hungry, field crickets will cannibalize each other. 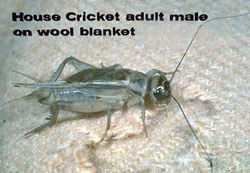 Diet: House crickets attack all types of material, and often it is synthetic fabrics that are most damaged, although cotton, wool and silk are attacked as well. They also feed on food such as baked goods as well as other organic matter and insects both dead and alive. 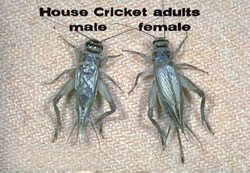 Other Information: House crickets are knows for their characteristic chirping noise. 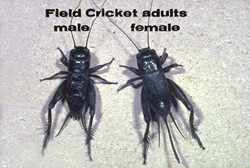 It is only the male cricket that sings and he does so to attract females. When they chirp, crickets rub the teeth on the sharp edge of one wing against a thick, rough scraper on the opposite wing, using it as a bow. As the temperatures rises, their songs become louder and faster.